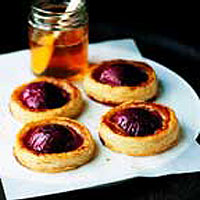 These simple little tarts celebrate the ripe juiciness of English plums. Look out for varieties such as Marjorie and Victoria. Preheat the oven to 200°C, gas mark 6. On a floured surface, roll out the pastry thinly. Cut out 4 x 9cm-diameter discs, using a cup or mug as a guide. Arrange on a baking sheet lined with non-stick baking parchment. Brush each pastry circle with the beaten egg and place a plum half on top. Using half the honey, drizzle a little over each plum, then dot with butter. Bake for 20 minutes or until the plum is soft and the pastry is puffy and lightly browned. Drizzle the remaining honey over each plum to glaze and serve warm with cream or Waitrose Dairy Vanilla Ice Cream.